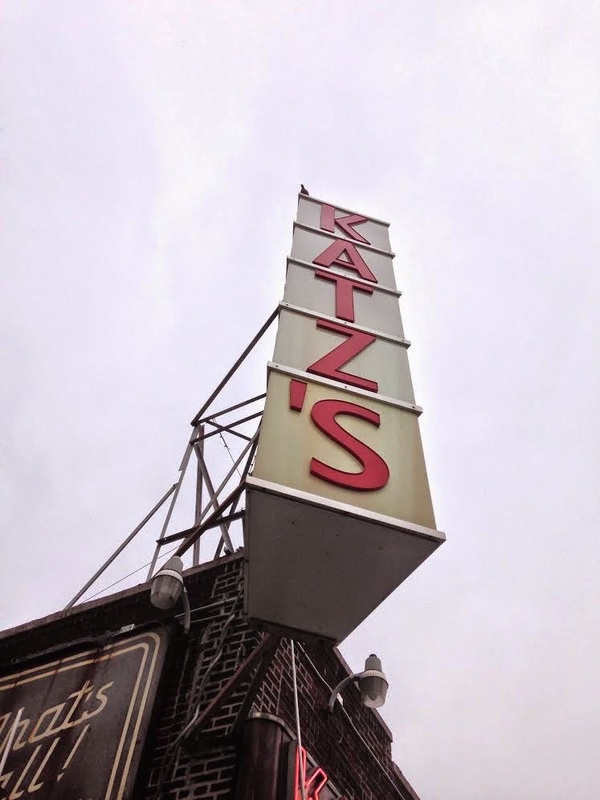 In case you missed this story from Friday … Katz's has sold its air rights. However, the 126-year-old deli isn't going anywhere. Just getting some new neighbors, mostly likely. BoweryBoogie and The Lo-Down first reported on this Friday morning. 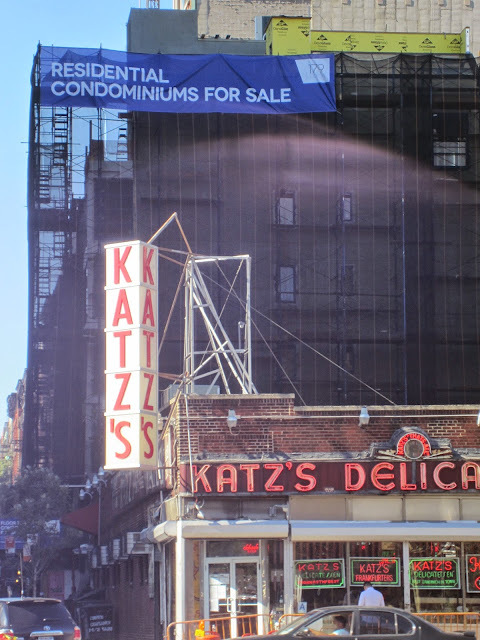 The most important thing is that the future of Katz’s is secure — at the end of the day, no developer can ever come in and knock us down to put in a high rise. 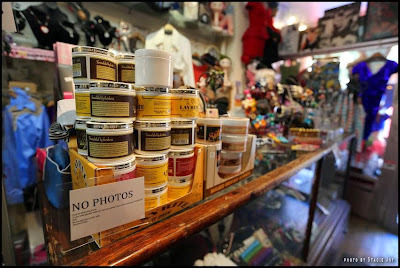 At no point will anyone value the corner of Houston and Ludlow for anything other than Katz’s Delicatessen. A year after our 125th anniversary, this will help ensure that we can see our 150th, and hopefully many more to come. As for the rest of the block… BoweryBoogie reported back in March that Ben Shaoul was close to buying that L-shaped parcel of single-level businesses. Several of the restaurants have already cleared out, including (sob) Bereket. The 2008 Lower East Side rezoning allows for buildings up to 12 floors (120 feet) here. You can get a choice seat to this likely incoming development from one of those new condos right behind Katz's. 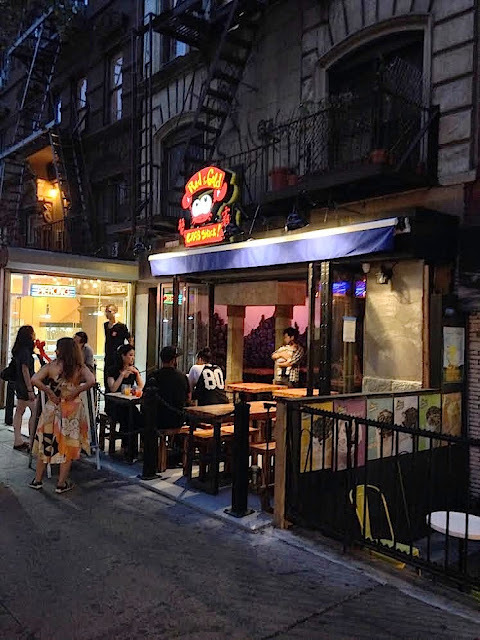 As we first noted back in April, a new restaurant called Crab Shack was taking over the former Japadog space at 30 St. Mark's Place. Thanks to Jordy Trachtenberg for the tip on Friday and EVG reader John H. for the photos! Nearly 16 months after a fire ripped through 116 E. Fourth St., there's news about the tenant, Mono + Mono. 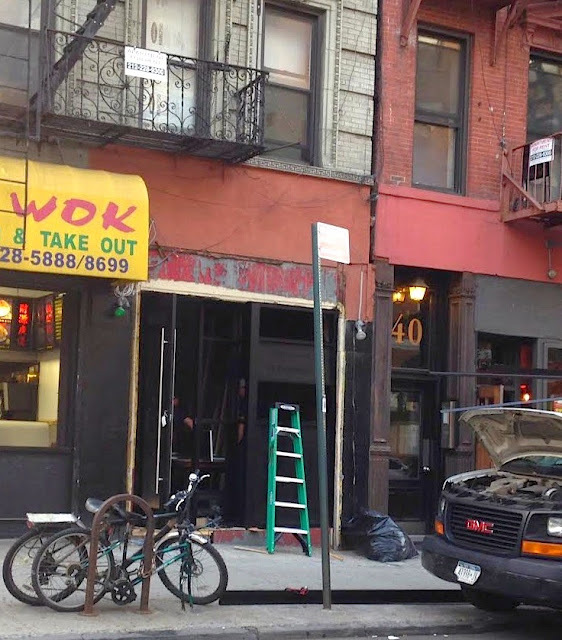 DNAinfo reports that repairs are underway at the restaurant that served Korean fried chicken and was known for playing a collection of upwards of 30,000 classic jazz albums. [T]the owner hopes to reopen in about three weeks, said Sung Chung, manager and event coordinator. 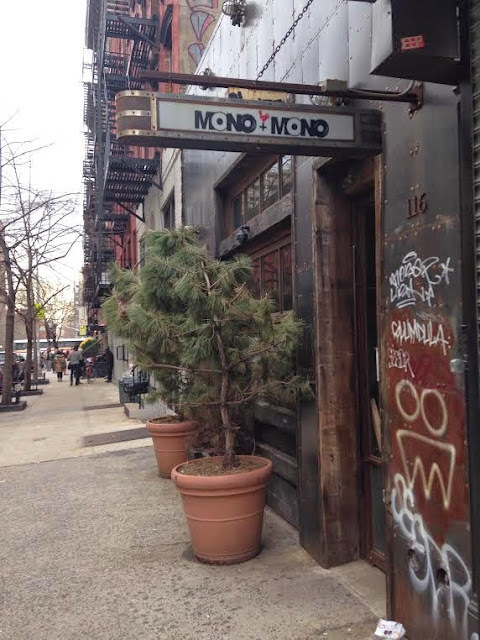 Before the April 2013 fire, Mono+Mono was only open for dinner, serving its signature twice-fried chicken with soy garlic sauce, alongside traditional pan-fried Korean pancakes. 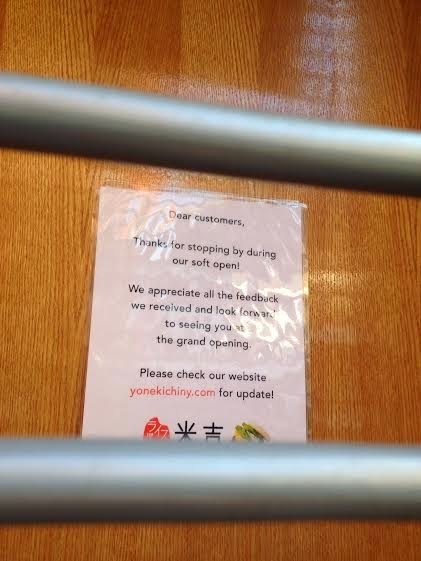 Now, it will be open during the day as well, with a slightly different concept, Chung said. He declined to give additional details. The city approved the renovation work back on Aug. 8, per DOB records. 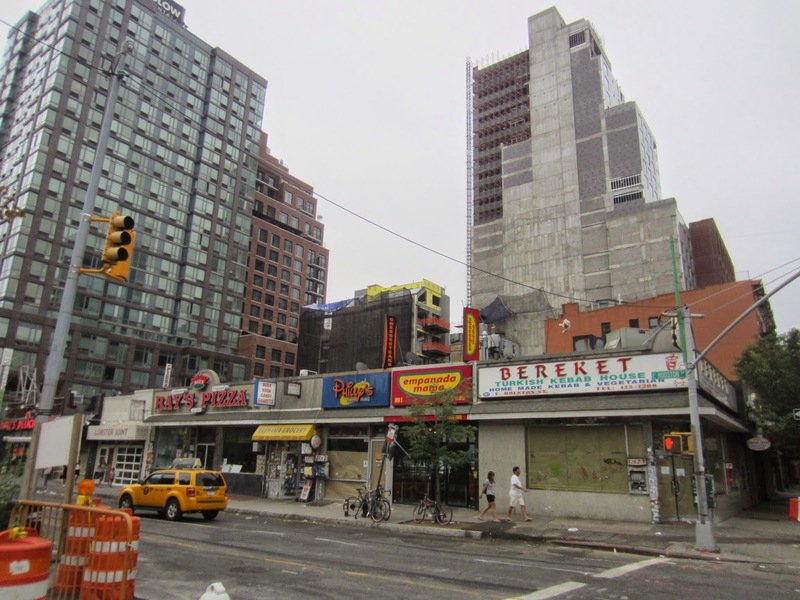 However, a full vacate order remains on the space between First Avenue and Second Avenue. What is happening with the Mono + Mono space? Thank you to Dangerous Minds for unearthing this video... 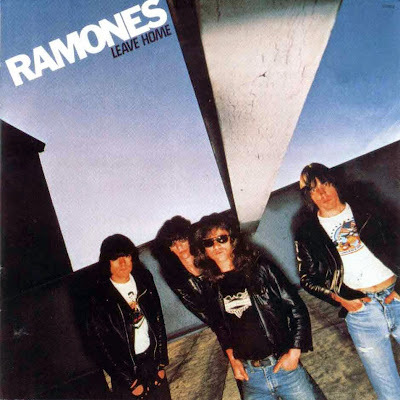 The Ramones playing on the Jerry Lewis MDA Telethon in September 1989. Ah! And YOU thought it was going to be just another dreary Labor Day Weekend hereabouts! Not SO. 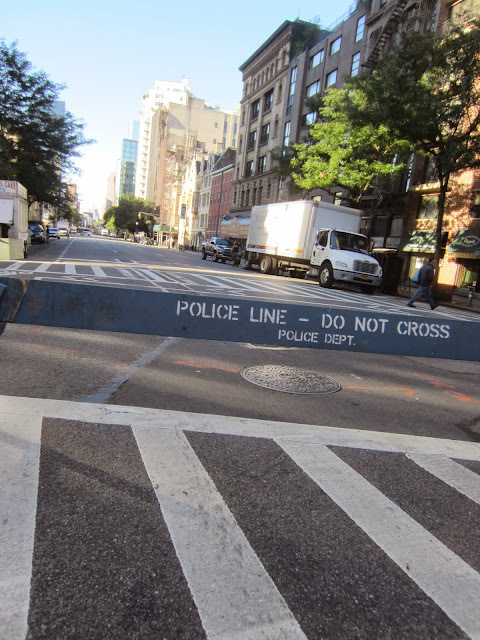 The action will be here on Fourth Avenue between 14th Street and like Astor Place. 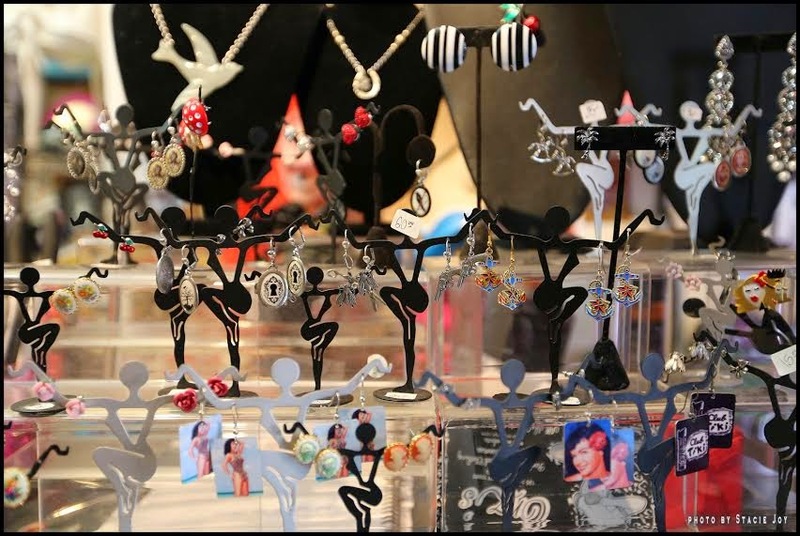 And for real — doesn't seem as if there were not as many street fairs as in previous summers? By our count, this is No. 5 since May. We could have missed one. Though did we ever leave town this summer? 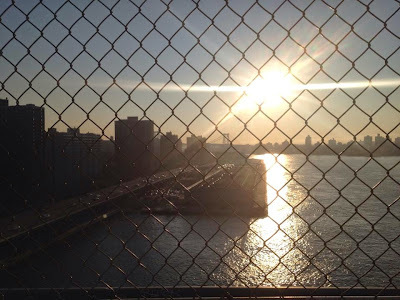 Brooklyn Vegan refers to Joanna Gruesome's music as "twee/punk-inspired." That description works for us. 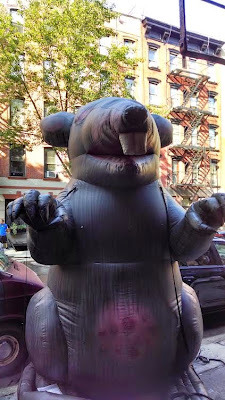 When Caroline Bragdon, a rat expert with the city's Department of Health and Mental Hygiene, walks through the East Village, she's not looking at the people or the storefronts. Her eyes point down, at the place where the sidewalk meets the buildings and the street. "If you look really carefully, you can even see their hairs," Bragdon says, pointing to a little hole in the sidewalk next to a sewer grate. "When we see something like this, what we say to each other is, 'This catch basin is hot.' You know, 'This is ratty.' 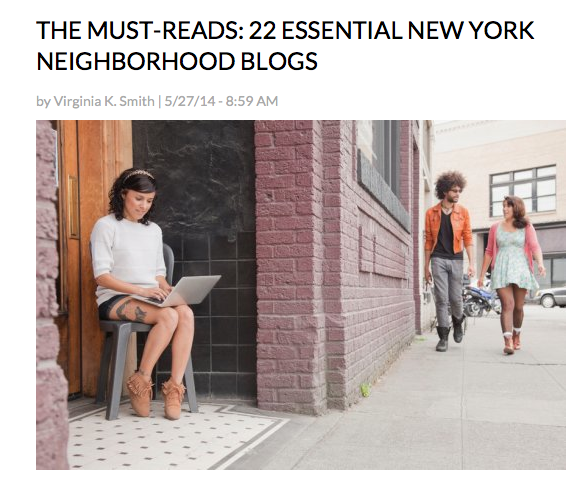 "
By that measure, this is one of the hottest neighborhoods in New York City. And it's one of the testing grounds for the city's new "rat reservoir pilot" — an initiative to try to reduce the rat population in neighborhoods with chronic infestations. Part of the plan is to hire extra exterminators and to seal up holes in sidewalks, parks and other public infrastructure. Rats can squeeze through the tiniest opening "in doors, in windows, in sidewalk curbs, in any building infrastructure," says Bragdon. "Rats only need a hole or a gap the size of a quarter to enter." Woo! Maybe we can think of some other 'reservoir pilots' for the neighborhood! Read/listen to the full report here. The listing via Jud Leasing, and last updated on Monday, notes that this is a "great location for restaurant, fast food venting in place." The occupancy for a new tenant is "arranged." 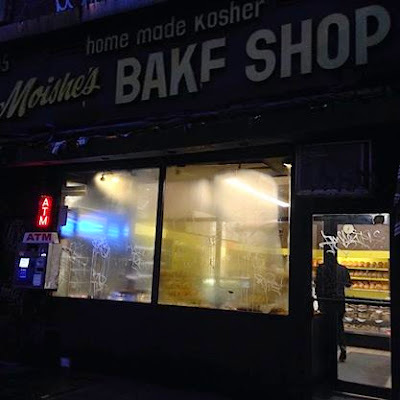 In September 2012, The Local reported that Moishe's was going to renovate the ground-floor space, dividing the bake shop into three sections that would include a café. 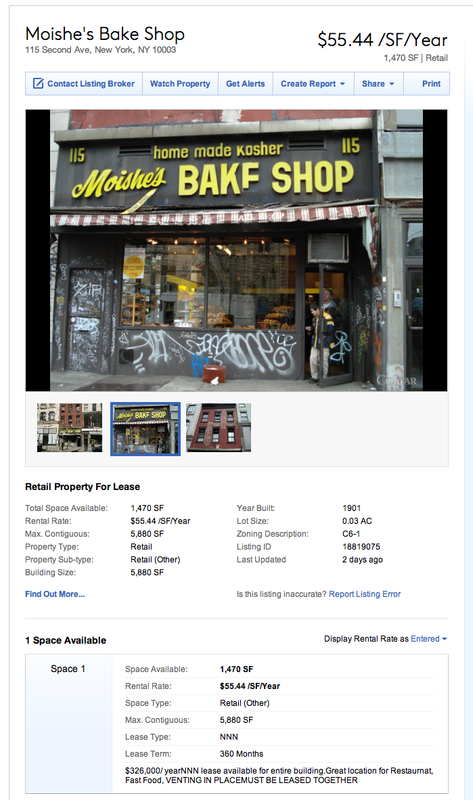 The floors above Moishe's, which previously had been for lease, were also set for a renovation. However, there were never any work permits filed for the building, according to DOB records. 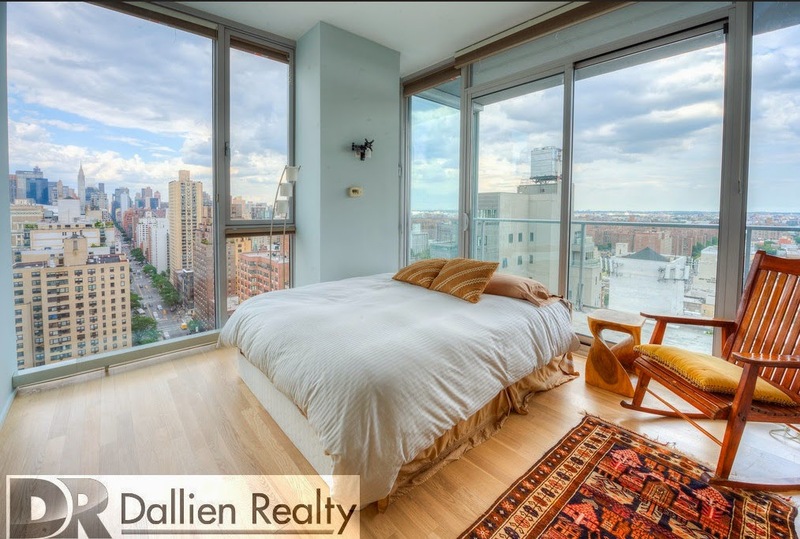 Starting Nov. 1, you can rent this three-bedroom penthouse at 110 Third Ave. near East 14th Street. The open Chefs kitchen features Volcanic Basaltina counter tops and Subzero and Bosch appliances, including dishwasher and washer/dryer. The master bedroom features an on-suite bathroom with his and her sinks and an 8’ Mr. Steam full body spray showers and sound system. 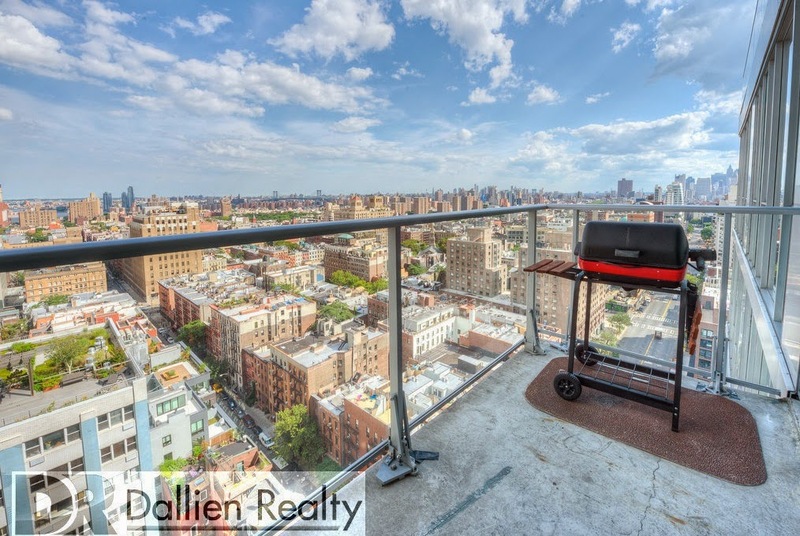 This condominium is a phenomenal residence for anyone looking to live at the top of a prestigious New York City luxury building with a full time concierge and doorman. In addition, this luxury building has a fully equipped fitness center, illuminated contemplation garden, and cold storage for Fresh Direct. Going rate for the great BBQ views and Mr. Steam — $12,000 a month. 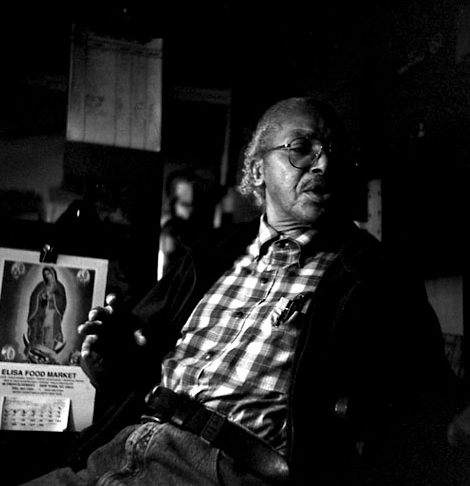 The documentary is just one of several projects in the works. Among the others are a theatrical play, a book and a film, which already has Oscar-winning director Martin Scorsese attached. Billboard also reported that Linda Ramone, who controlled Johnny's half of the band's estate, and Joey's brother Mickey Leigh, who oversaw Joey's half, are now cooperating as a happy family after years of behind-the-scenes feuding. Read the rest of the Billboard article here. Catching up to this item from The Commercial Observer on Monday. 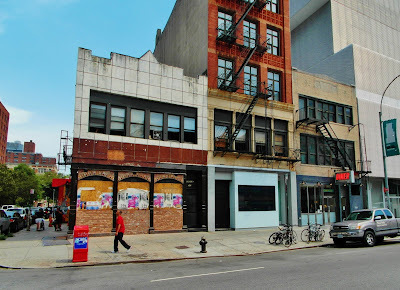 Owner Roseann Carone is downsizing the Sunshine Hotel space, converting the second and third floors of the SRO at 241 Bowery into commercial lofts. The space is adjacent to the New Museum and above Mathieu Palombino's Bowery Diner/Chez Jef on the ground-floor. The Sunshine Hotel residents, which now number 30 to 40, occupy the complex's neighboring building at 239 Bowery near Stanton Street. 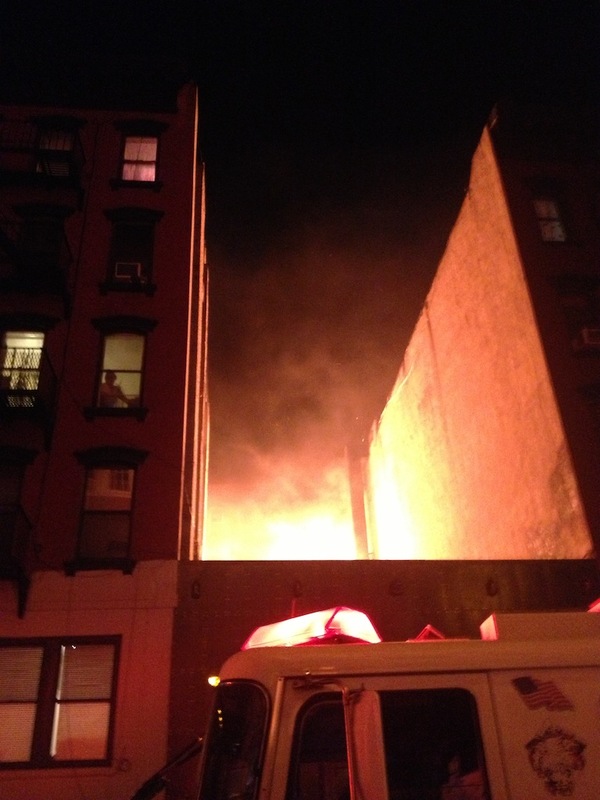 According to the Observer, the three-story 241 Bowery had 34 beds on the second floor and 52 beds on the third floor. The residents apparently had not been using the space that workers will be converting into office space. 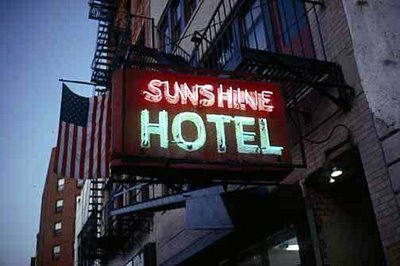 The Sunshine Hotel is one of the remaining Skid Row Bowery holdouts that has been on deathwatch the past 10 years. Given the recent news about the Sunshine Hotel downsizing its space to make way for commercial office tenants … we thought we'd replay this post that first appeared here on July 19, 2012. 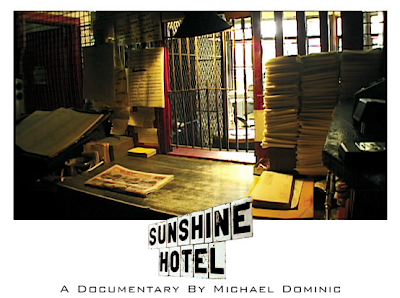 In 1999, filmmaker-photojournalist Michael Dominic set out to document the residents at the Sunshine Hotel, one of the few remaining flophouses on the Bowery. He wanted to know more about the men who had been living there, in four-by-six-foot cubicles topped by a ceiling made of chicken wire, with no particular place to go. Dominic's ensuing documentary, "Sunshine Hotel," released in 2001, received a slew of festival awards and played on the Sundance Channel. The independently funded film was recently released on DVD for the first time. On this occasion, Dominic answered a few questions via email for us. Have you been back to the hotel in recent years? Have you received any updates about the people who you featured in the film? The sister of one of my subjects in the film named Vic contacted me recently. He died in 2006, but she only found him again after nearly 50 years through my film. She and her brothers were able to gain some sort of closure after a very long time of believing he was a missing person. It was a moving experience. For you, what are the most profound changes of the Bowery during which the film is set and the Bowery of today? 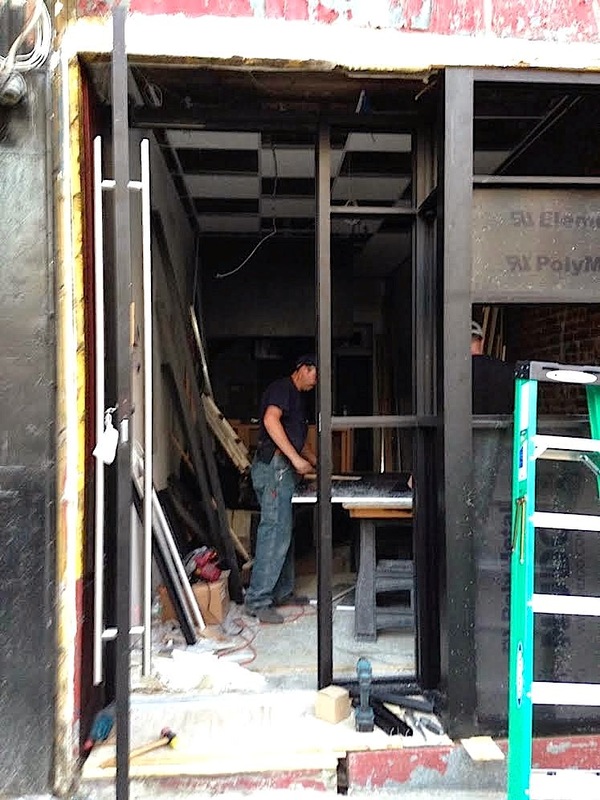 The Bowery is ever changing. Now it's on an upswing. On the ground floor of the Sunshine Hotel there is a new restaurant and an art gallery. It looks like they're planning another restaurant as well on the corner. As soon as the last of the tenants leave the Sunshine, I'm sure that they will convert the buildings into luxury housing. When I shot Sunshine Hotel back in 1999, the Bowery was already what I thought of as gentrified. But now, looking back, that wasn't anything. Certain parts have been completely rebuilt and there's really nothing left of the old strip as far as the goings on. 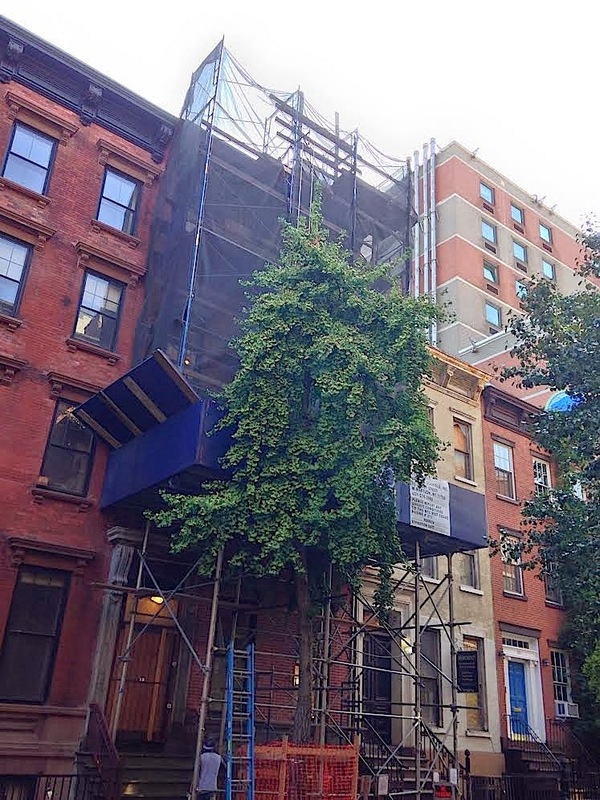 There are expensive restaurants, hotels and apartment buildings — and there isn't a single actual flophouse on the Bowery anymore. Is that a bad thing? Times change and probably a long strip of drunken homeless men running through the center of the Lower East Side isn't the best idea. Still, when I look at the Whole Foods on the corner of Bowery and Houston, it leaves a bad taste in my mouth. The DVD release allows a new audience to experience the film. What would you like people to take away from "The Sunshine Hotel"? People should remember what NYC was. They should remember it as something unique and beautiful, albeit seedy. We as a city have overdone it on clean-up. We have lost character. I hope that my film caught a little of the last of that era of New York, "when the Bowery was the Bowery." Some 13 years later, what has stayed with you about making this film? Nathan [Smith — the hotel's manager]. His friendship. He died 10 years ago, but rarely a day goes by that I don't think about him. You can buy the DVD here ... it's also available on Amazon. Dominic is now working on a documentary titled "Clean Hands," which chronicles the residents of La Chureca — Nicaragua’s largest, most dangerous garbage dump. Captured today by Bobby Williams. Just makes us miss @EVLambo all that much more, though not really. 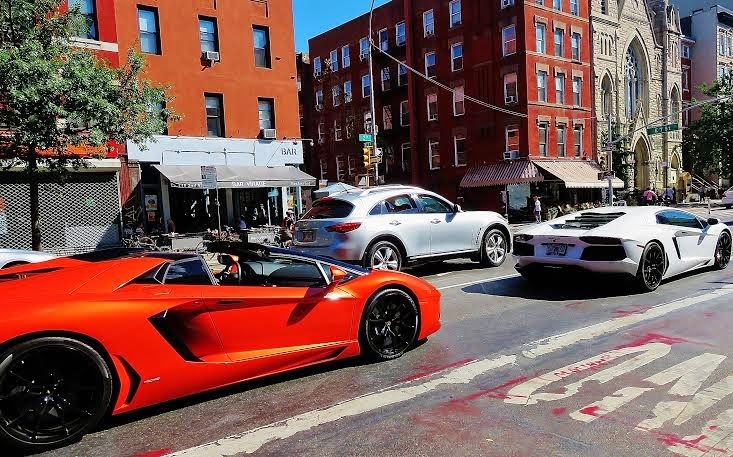 Today over at Curbed, photo journalist Nathan Kensinger takes a look at the ever-changing Bowery ... providing 20 updates on current or upcoming developments. Despite the luxurification the past 10-plus years, "this 'land rush' is only now reaching its peak, and in the next few years, the already altered landscape of this once scrappy, iconic boulevard will become wholly unrecognizable." 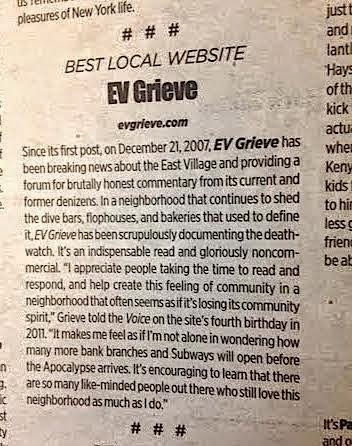 The post includes a quote from EVG as well as Jeremiah Moss. 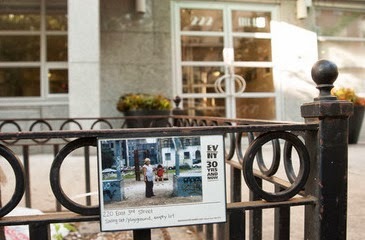 Earlier this week, East Village resident Daniel Root shared a new photo project with us, a Tumblr titled EV NY: 30 yrs and now. Photographer Daniel Root documented the East Village in 1984. 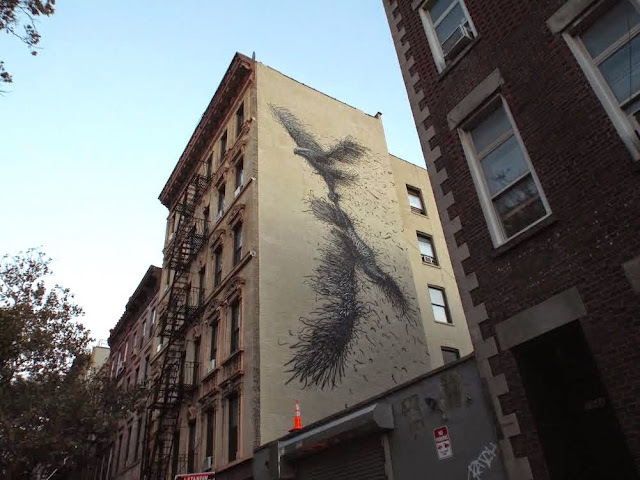 Today, he revisits the locations and documents their current state. 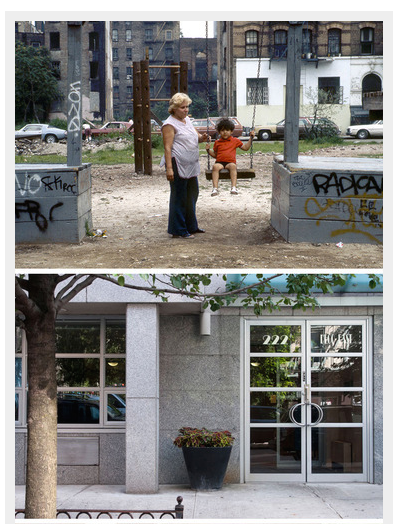 In addition to the then-and-now shots, Root added a photo of the contrasting scenes at the sites. "I have been living here since the summer of 1984," Root told us via email on Tuesday. 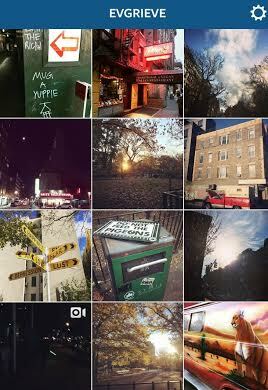 "At the time a friend of a friend wanted to write a book about the changing East Village and she wanted some photographs to pitch the book. The book was never written. Last year it occurred to me that those photographs were about to be 30 years old and I thought to hang them approximately where they were shot. 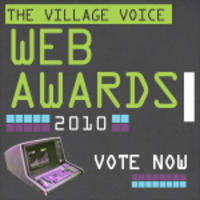 The Tumblr site was a relatively recent addition prompted by a friend." 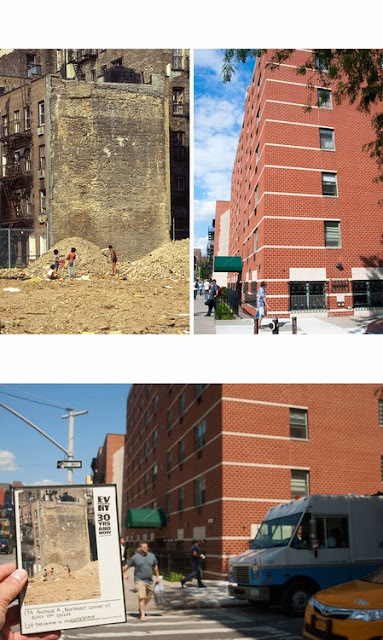 "I think what struck me the most while looking at the 'then vs now' shots is how much cleaner, neater and orderly things looks now," Root said. 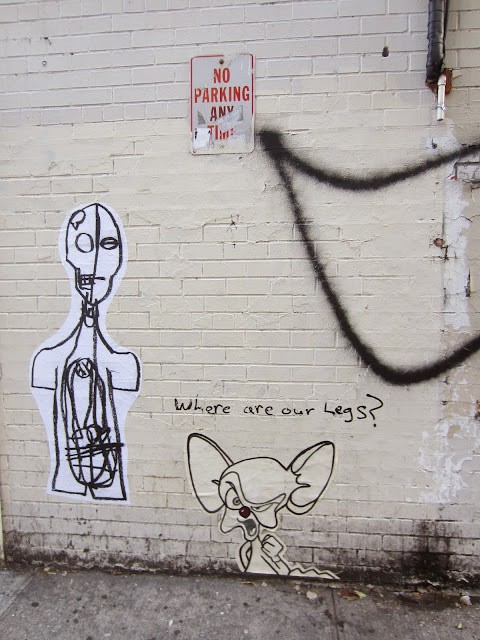 "On the other hand, a number of places don't look that different. 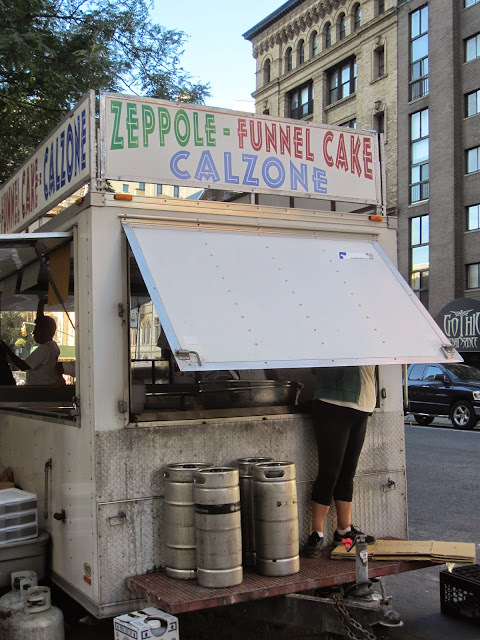 For example, the Pyramid and the southwest corner of Tompkins Square Park." Find more of his then-and-now shots here. The building will contain six floor-through condos above the ground-level retail space. Each of the units on the second through fifth floors is nearly 1,100 square feet with balconies at the front and rear and loft-style elevator access. The second-floor unit also has access to a private garden. Prices start at $1.65 million. Hopefully the aroma of Katz's pickles won't bother these folks. The Italianate townhouse, built in 1867, is getting a gut rehab … converting the building into two residences. 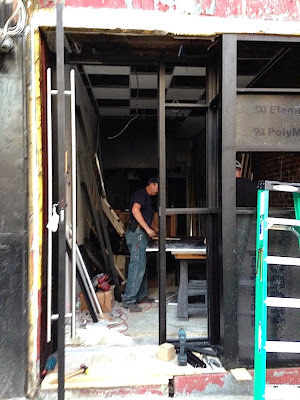 Workers continue to transform the former Cafe Rakka space at 38 Avenue B into Dojo Izakaya, which the Post described as "a Japanese gastropub." 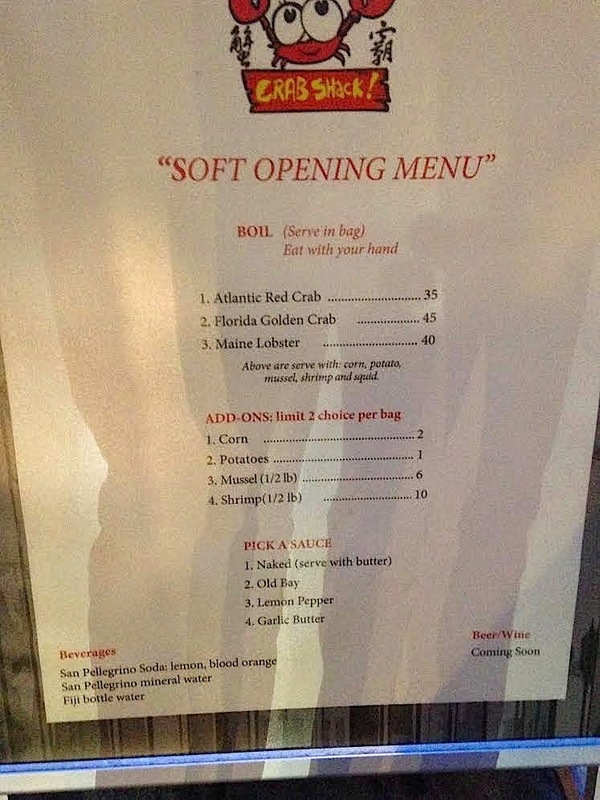 It will be the latest restaurant from chef David Bouhadana, who opened Sushi Dojo in June 2013 at the former Polonia on First Avenue. The inexpensive long-timer Cafe Rakka got Cromanated last November here near East Third Street. On behalf of the entire Salinas family, I would like to applaud Civil Court Judge Jennifer Schecter for her heroic decision earlier today, which for the second time in less than 10 days, stayed all eviction proceedings against our family business. I would also like to take this opportunity, to once again thank the thousands of New Yorkers who have signed our petition and have sent us notes of encouragement to help my family stay strong through this very trying ordeal. 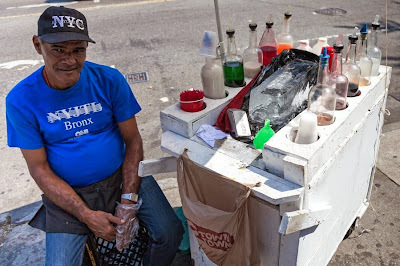 What my family has learned through this struggle to save our business (which has been in our family for more than 4 decades) is that this fight had struck a nerve in the heart of many New Yorkers. 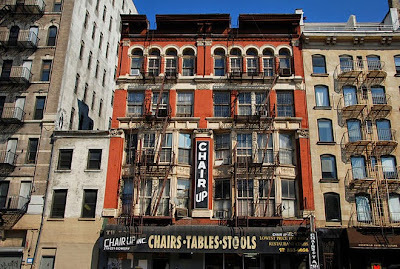 This is no longer a fight JUST about my family and our livelihood, it is about saving the character and charm of Olde New York by preserving our building, which has served both famous as well as everyday day New Yorkers proudly for more than 77 years. We also would to commend the work and support of the New York City’s Landmark Preservation Commission, Councilman Dan Garodnick, and State Senator Liz Krueger for standing behind our fight and their willingness to meet and help us as we continue to try to save this treasure. 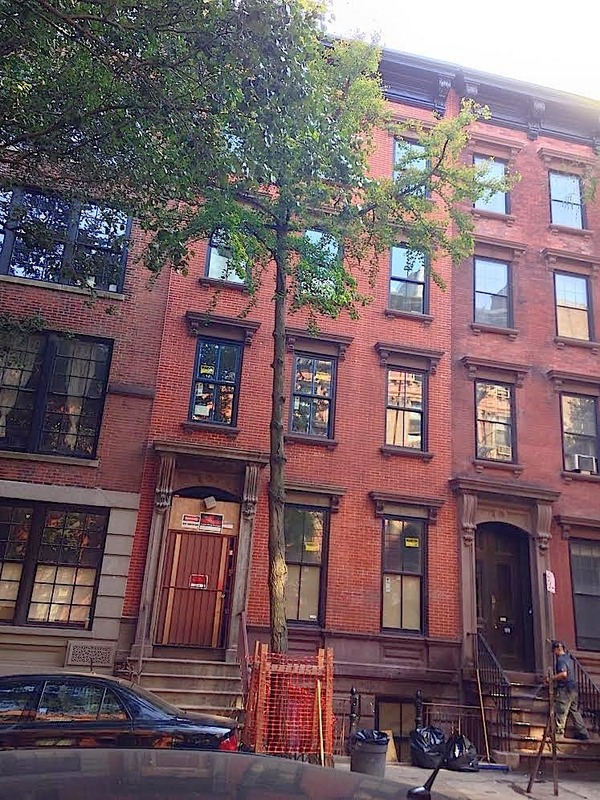 Here 's more background on the situation here on East 60th Street. 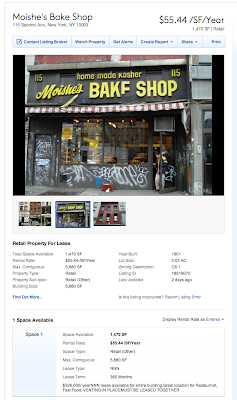 According to Eater, Subway's lease is up in February. The World-Wide Group’s lawyer offered Oct. 21 as a new move-out date, but Subway Inn lawyers refused and asked for Nov. 30, saying it would take time for the Salinas family to find a new place to relocate their business. Claude Castro, who represents Subway Inn, also asked that the Salinas family be able to take the decades-old neon sign, as well as the bar’s furniture when vacating the space. The World-Wide Group’s lawyer refused. [Updated] Should we start worrying about the Subway Inn? EVG reader Shaun Stewart shared this photo of a new mural that went up on the south side of St. Mark's Place between Avenue A and First Avenue. Anyone know who the artist is? The mural went up on Monday. And find more of Shaun's photos on his Tumblr, NYC City Graffiti Fishing. Thanks to Bucky Turco at Animal NY for letting us know that the artist is DALeast. I grew up in Las Vegas. I could walk to the Stratosphere. My dad was an electrician and my mother had 11 children. I lived in a very conservative household in the City of Sin, right by the strip. We used to drive him to work every morning and basically watch the strip get built. I moved here six years ago in my teens. I was 19. I had a suitcase. I didn’t know anybody and I worked in a café and I slept there at night. It was called Net Café on 14th and 2nd Ave. It was an Internet café. It was in the hole but the owner wanted me to manage it and pull it out because he liked my personality. My home was a public space, so there seems to be this theme. I came here for many reasons. 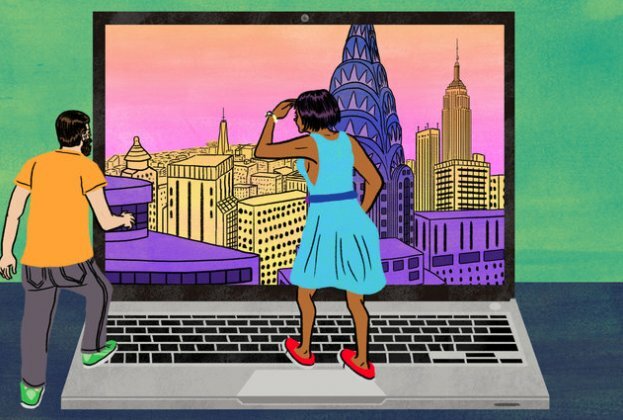 When you want to do stuff you come to New York. We don’t even know what it means. New York is romance. I’m very attached to the romance of surviving in New York City, or thriving here, or just being here. I was doing these, not really paint parties, but paint parties. I just started covering myself in paint. What was I thinking? I was having a hard time leaving the apartment because I’m a very private person. Then I started painting myself and leaving my apartment. I’ve known everyone since I started painting because I was able to leave my apartment. Everyone met me covered in black. I started covering myself in ink and coming outside. Then other people started playing with me. Everywhere I touched people you could see the inkblots. I started to see the way I was interacting with people was very informative. I was covered in ink all of the time and I had it dripping out of my ears so I could paint people and then people started coming and playing with me. It became almost like a church. Everyone came and would paint each other and paint the walls and cover each other. And everyone started looking like the same color and falling asleep in my home, stuck to each other with paint, and peeling it off. The latex and the glitter and the confetti would build and build. It was an incredible exploration. I went from knowing no one to having interactions with people in my home. It was kind of like a family structure. We were all participating in each other’s projections — me as the mother figure and them as my children to some extent but also kind of like my siblings because I’m from such a big family. So many motherless obviously were attracted to the way that I host a home, which is that everybody is welcome, of course. Bring you and all of your perversions. It was the house of Satan. I was covered in toxic ink from my chin down to my toes. The more that people needed to me touch the more they let me consume them in toxic ink that dripped out of my ears. It was dark, like demanding that they participate in my depravity if they want to be friends with me. That’s to be friends with all of me. To have your bed be filthy with ink is to have me in your home. It was dark and then we switched to paint, which was much friendlier. And then baby powder and now sand. Obviously we got kicked out, because what I started I couldn’t stop. People were coming in and out, bringing paint out. Paint on the floors. Everywhere you touched you could see. Everybody was here and I couldn’t clean it up as fast as they were coming in and out. It was beyond my control. I created something that I couldn’t control. And help… I can’t even control myself. I wouldn’t want anybody to ask me to control myself even in their home, so how could I ask my children to? Be free. So it actually became out of control and they asked me to leave. I said yes because I agreed that we were out of control. But I always get asked to leave. 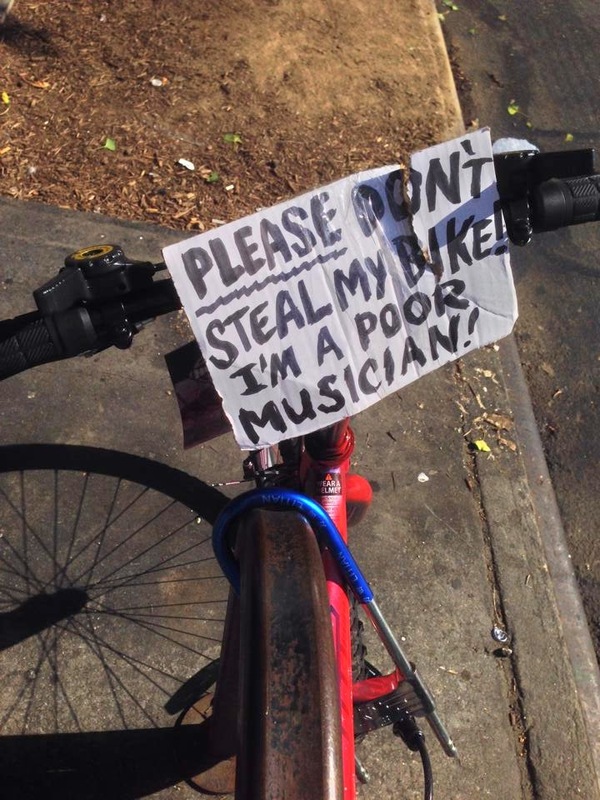 If this keeps happening I’m obviously the problem, you know, so of course I leave. Perhaps I’m out of control or maybe I’m just smart. I’m not entirely sure, but I don’t believe in saying no to anybody, which can be destructive to my home, but whatever. I don’t know. This is what I believe. There is something about 7th Street. All will agree. I’m running a bridal shop here. I make things for everyone. I had the street in my living room and then I had my living room on the street. I wasn’t paying rent and so people were bringing furniture from the block and I was creating a living room every single day. This started two weeks ago. It was first a free leather shop, then a free barber shop. I had the kids here making mustaches out of shaving cream, letting them cut my hair because I could just weave in more dreads, the way my hair is right now. I was shaving heads and legs. It was just a blast. And to touch people and to play with each other is just so much fun. I saved her [the pigeon] on the block. I found everything on the block. Everything I need is right here. Then it became a bridal shop, because we’re all getting married, you see. Everybody is getting married. Will you marry us? We’re all going to marry each other because I love everyone. That’s why I was evicted, so I think that we should make it official, because we are family. The party is Sept. 6 — save the date. It’s going to be at the beach and anyone who doesn’t have a gown, come to me. I am open from 12 to 6 everyday. I’ve been making wedding gowns and tuxedos for everybody. I’m dressing everybody. It’s all materials that people brought me — black and white unused things. I’m using all recycled material and everything is free. I’m going to town boy. Welcome to the bridal shop. I look forward to marrying you. Some people are new, some people are old. I believe that marriage is about love and I think we’re a family and I think we need each other because we’re not with our families. Maybe that’s why we were able to come to the island of Manhattan. Manhattan is the motherland and we’re the natives reclaiming the island. By abstaining. That’s how we’re going to get it back. I guess what I would like to say is that I’ve found that giving things away for free and not asking for anything in return has been very sustainable because people feel loved by me and want to support me. Because they’re overwhelmed. I love it because I need that, obviously. This is sustainable, what I am doing here. Freedom is sustainable, it’s crazy! And I’m learning more about it each day, because I even doubt myself and I continue with the concept. So it’s been somewhat religious. 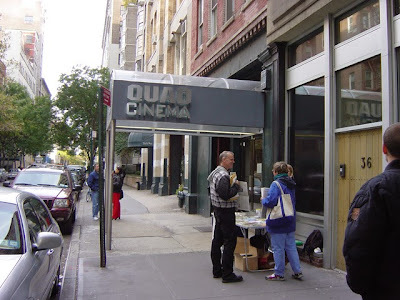 The Quad Cinema, family-owned and operated since 1972, is under new ownership, Variety reported. Gulp! The theater's new owner is real-estate developer Charles S. Cohen. 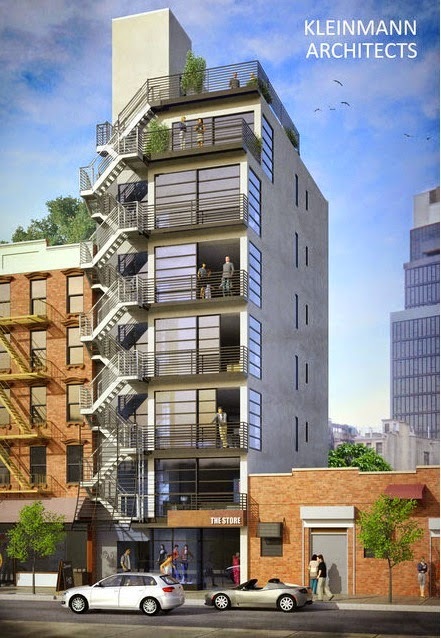 So can we expect the Quad Condos here soon on East 13th Street between Fifth Avenue and Sixth Avenue? Cohen plans to transform the facility into a repertory house, featuring films from the Cohen Film Collection. It’s a library that boasts 700 works by the likes of D.W. Griffith, Buster Keaton, Jean-Luc Godard, W.C. Fields and Alfred Hitchcock, and the exhibitions will include talks and lectures pegged to the movies being shown. In addition to film classics, the theater will also play foreign and indie titles. The Quad will begin a top-to-bottom renovation in 2015, Cohen said, and will be outfitted with the latest in digital projection and sound. One screen will still be able to show film prints. The name will remain unchanged. According to Cinema Treasures, the Quad was Manhattan's first four-screen theater when it opened in 1972. 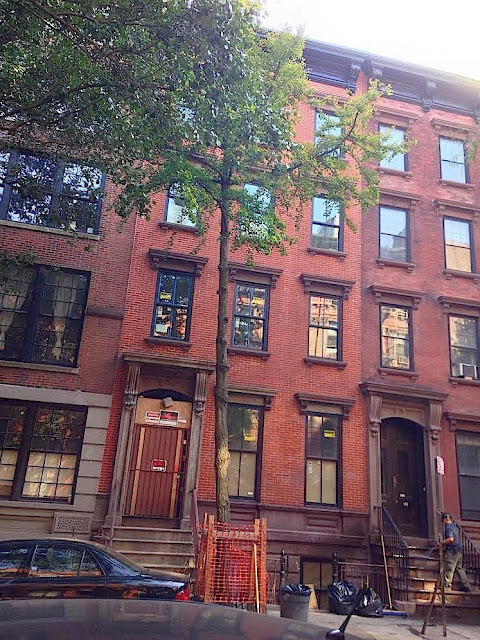 We do not know much, if anything, about this video ... other than that someone filmed it on East 14th Street at Second Avenue fairly recently (given that it only has 16 pageviews at the time we posted it) ... and the man in the video is wearing a diaper. Thanks, maybe, to the EVG reader who forwarded us the link. Wow, just nine items (nine items!) on the September CB3/SLA committee agenda. That just might be a record-low. Anyway! 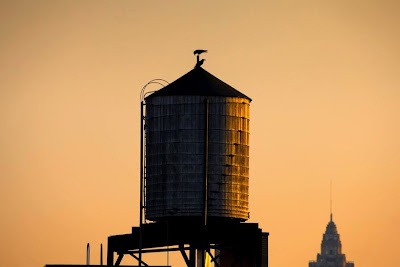 First of all, the meeting is Sept. 8 at 6:30 p.m. — Community Board 3 Office, 59 E. Fourth St. between Second Avenue and the Bowery. This is the vacant storefront between Alphabet City Beer Co. and Alphabet City Wine Co. Don't have info on this applicant just yet. Oh, one of those long-empty spaces where LeSouk enjoyed its reign of terror. Haven't met anyone who has been to this place. Huertas, a restaurant featuring "the cuisine of Northern Spain," opened back in April. 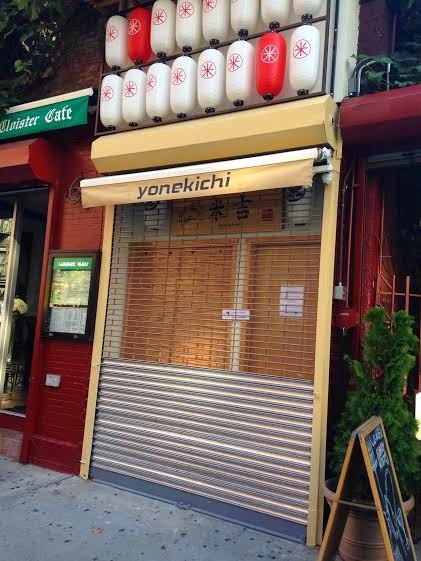 Yonekichi had its (soft) opening last Monday at 236 E. Ninth St. between Second Avenue and Third Avenue. And there might be at least one resident pleased about this development. You can check out the restaurant's website for the TBA grand opening info. 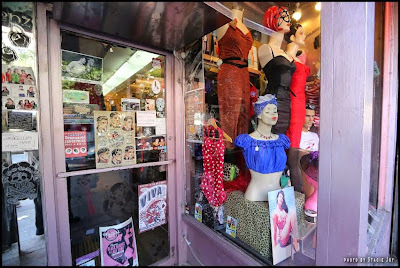 After seeing Facebook posts after the recent one-year anniversary party for the Park Slope location of Enz's, we decided to revisit the original Enz's (home of Real Rockin’ Clothes) in the East Village. 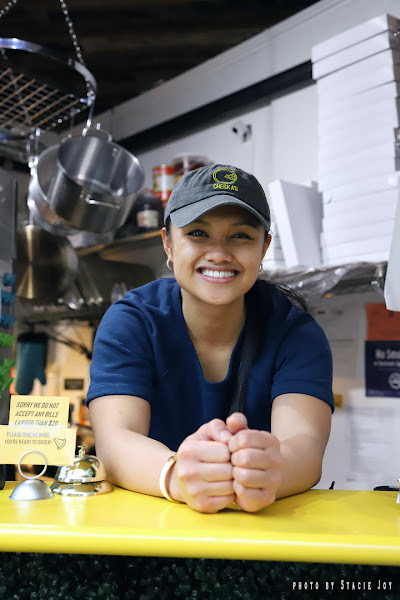 Mariann mentioned that she always wanted the shop to be on Second Avenue and she has done wonders for the slim space that used to be a cellular phone store. 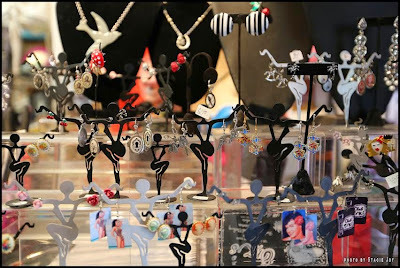 Every surface is packed with clothes (for men, women and kids), accessories and products, jewelry and makeup for sale. 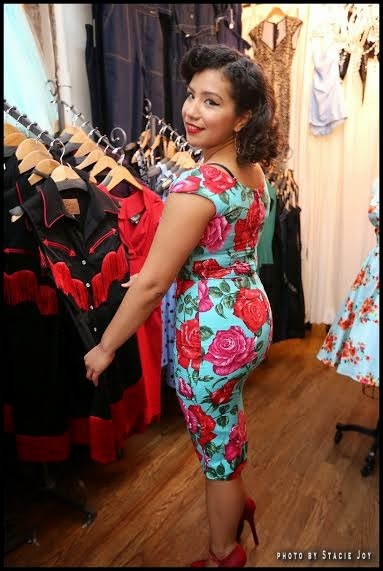 The shop carries designs for sizes xxs to xxl so most folks can be clothed there. 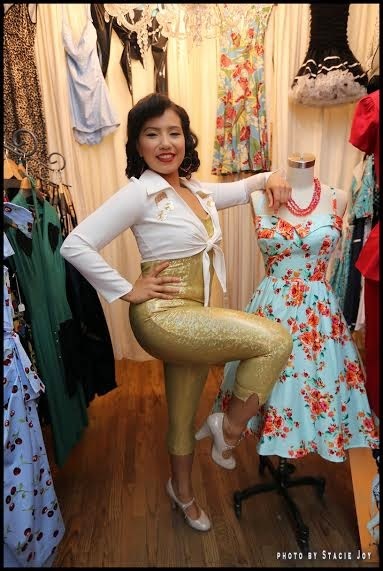 We asked Bianca Dagga to model some of the clothes that Mariann designed and styled, as well as a few from other retro clothiers. During the brief time we were in the shop many people dropped by to shop and talk shop. Drag queens looking for something couture and spectacular, a duo of sisters with their mom looking for high-waisted skinny jeans and ’50s-inspired tops, and international traveler Alejandro who graciously agreed to pose with Bianca (and who tried very hard to get her number). Layrite pomade was mandatory for this look. Enz’s is open every day, usually from noon until 8 p.m. 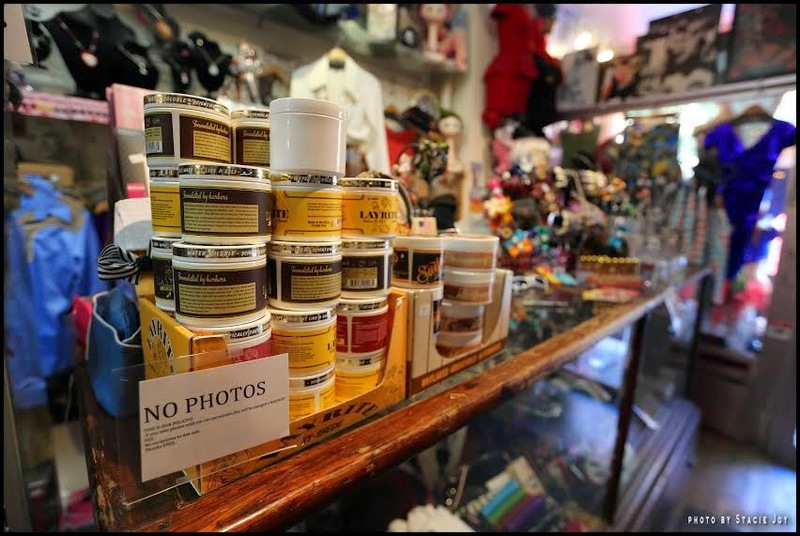 The store has policies that can seem a bit off-putting if you aren’t familiar. First off, you need to be buzzed into the shop. 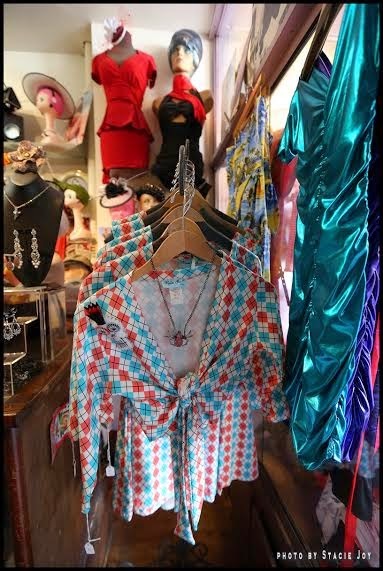 And appointments are strongly suggested, especially if you plan to try on items in the surprisingly spacious dressing rooms or receive styling assistance from Mariann or one of the shop gals.